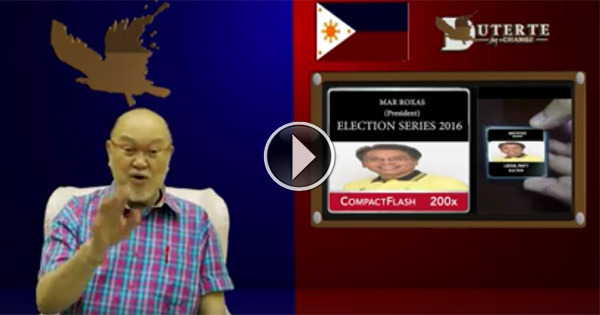 In this viral video, ex-congressman Augusto "Boboy" Syjuco Jr. has bared what he called the "3 kinds of cheating" in the May 9 elections. The former lawmaker and cabinet official produced and released on Facebook a video titled "Real Talk: Salamangka Sa Boto Ni Juan" on Saturday, May 7, just two days before the 2016 national and local elections. Syjuco, who served as chief of the Technical Education and Skills Development Authority (TESDA) during the Arroyo administration, said the manipulation of poll results particularly in the presidential race have long been ironed out prior to election day. He alleged that a Malacañang official "fixed" the Secure Digital (SD) cards in favor of presidential candidate Grace Poe, but former DILG secretary Mar Roxas, who is also running for president, knew about it and complained to President Benigno Aquino III. He said a confrontation took place, after which the SD cards inside the Precinct Count Optical Scanning (PCOS) machines (now known as Vote Counting Machines) were replaced. Now, the new SD cards to be used by the Commission on Elections (Comelec) nationwide favor Roxas and LP candidates, Syjuco claimed. He said fake VCM program and servers will be used to add votes for Roxas and other LP bets in the national and local polls. The ex-solon also bared that a fake computer program will also be used in the "transparency server" that will show fake election results to media and the public. Syjuco stressed that massive cheating will take place during the elections. The video already got more than 165,000 views on Facebook as of 12 noon today.